Last week, several Detroit residents called out The New York Times for a recent check-in on the city's health but not featuring any representation of color. Today, NYT public editor Margaret Sullivan and NYT travel editor Monica Drake have a response. 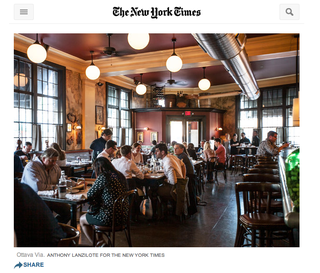 Let's do a quick revisit: The NYT sent a freelancer to Corktown to check out the business scene. In "A Gleam of Renewal in Struggling Detroit," several businesses and residents were highlighted — but they were all white, despite Corktown being a majority-minority neighborhood served by a Latina councilwoman in an 82%-black city. Michael Jackman at Metro Times was the first to take the NYT to task, followed by my response here at Jalopnik Detroit. Kelly Guillory, a local artist and author, contacted the piece's author, Julie Alvin, who then apologized for omitting people of color. Motor City Muckraker and Deadline Detroit printed her apology, with some note that the author is from the Grosse Pointes — and thus, should have some familiarity with the diversity of this region. Since Monica Drake became The Times's travel editor about a year ago, she has tried to broaden and diversify the section's offerings. Her effort is going well — but not perfectly, as evidenced by recent criticism of an article and photo spread on Detroit's Corktown neighborhood. The piece, written by a freelance contributor, has been slammed for featuring only white business owners. After all, Detroit is more than 80 percent black. I heard from a number of readers about it. Ms. Drake told me that she never wants to force diversity into stories — "I don't believe in checking boxes" — but that she does acknowledge the problem with this article. "It was an oversight, but clearly, we didn't successfully depict Corktown." The writer, she said, was concentrating on those businesses that seemed to her the most important to the neighborhood's resurgence. It's not quite a "we're sorry," but it's close enough. Drake says she will discuss the issue with her staff privately.